It must piss her off to have to share the party with recycled Nats, but she's holding her nose for the greater good and remains relentlessly on-message. She is a machine when she gets stuck into something (or someone) and Act are very lucky to have her, but her candidacy thing is a brave lark and I expect she will pull out before the final list meeting once she has performed her task of selecting a suitable, preferably younger, female face for Act. Don's in charge because that's his condition of membership, so he's No. 1. 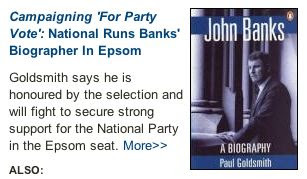 John Banks is standing against his own biographer acolyte in Epsom, so Banks will take the seat and have a hold allowing him to end up No. 1 after Don goes. But Banks isn't an Act guy, he's a Tory Nat and it is that problem that will spell the end of Act even if they manage to put something together with National post-election. It's all opportunism and very little ideological coherance with a Brash Banks leadership. Whether Banks has to be No.2 or not is of no importance to him compared to having been allowed a clear run in the Epsom Electorate, but he will probably be at 2. The Federated farmers guy, Don Nicolson wants 3 or 4. He'll probably get that because farmers vote and are rich and Act can argue that along with their conservative social policies and newly (re)found Maori-bashing Act is the natural party of the farmer rather than National. John Boscawen deserves to continue as deputy but if Banks wants No.2 his lack of ego will push him back to 3, 4 or 5. Whoever Cactus Kate can attract by way of an ambitious corporate female success story will be treated as a head-hunted trophy to be put at No.4 or 5 in an attempt to make the list look less gender-biased. No.6 means the party gets to the 5% threshold or thereabouts and then the power swings to Don Brash rather than the constituency-holding John Banks. I have no idea who might fill No.6. Hillary Calvert hasn't amounted to much and went along with the coup against Rodney so she may be put at No.6 for her short service as an ACT MP so far, but the inner circle won't expect - or care - because I doubt they will count on getting above 5% or getting a sixth MP. The official target must be 5%+ but anything over 3% will be considered a victory in the circumstances. Some personally wealthy individuals may well end up at 6, 7, 8 as a means of funding the campaign - like the scenario with Boscawen last time. With Brash and a new crew they will attract the money they need to go on, but being right wing and unpopular it always costs a fortune. The tide is running out on Act as it wallows with all the scars of their political and personal hypocrisy, mistakes and compromises in government fresh and painful, tender and in the open. It doesn't help at all either that the Nats are pushing privatisation as a main policy as many ex-Act voters will keep voting National. An electorate ensures parliamentary survival and 3% on the list is just big enough to have some impact on government - it's like what they have done this term and it's a very achievabale aim for this election given it is now under new management. If the Nats get to 45% that puts Don Brash in charge of something in a new government. It is this prospect that ought to motivate many left non-voters back to the ballot box. The left parties can easily paint a simple caricature of out of touch extremism with Brash in front, so he has arguably been more of a boon for the left than the right. Well sussed, Tim. Your analysis is spot-on - especially if ACT scores above 5% opf the Party Vote. A result like that would reaffirm Brash's primacy as leader; make ACT less reliant on Banks; and reduce Banks' authority sufficiently to maske him less of a threat to the encumbent leader. In the long term, I suspect ACT will be around one way or another, as they will always have a natural constituency amongst the rednecks, racists, and rightwingers. If it weren't for MMP, I suspect they would be an invisible faction within the National Party (as they were within Labour in the 1980s). ACT will get it's 5% or 7% in the election. No doubt it will make many in the National Party (those who actually are decent-minded) want to heave. But that is their problem, in the first instance. "This weekend I returned to one of my favourite holiday places, Thailand, and the Island of Koh Samui. I had plenty of time on a bean bag in the sun by the hotel pool to observe the latest state of the place as evidenced by the beach vendors peddling their wares to punters.It is asked by the likes of comfie living, poorly travelled Grey Lynn hipster Martyn Bradbury why I am so hard on New Zealand's heaving pathetic underclass. I do not and never will back away from that description." Cactus Kate - she's a self-parody, right??? 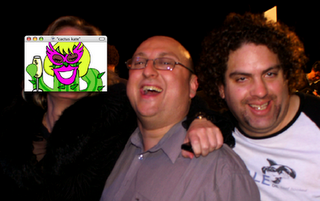 Probably the most astute post on this blog in months...perhaps years.